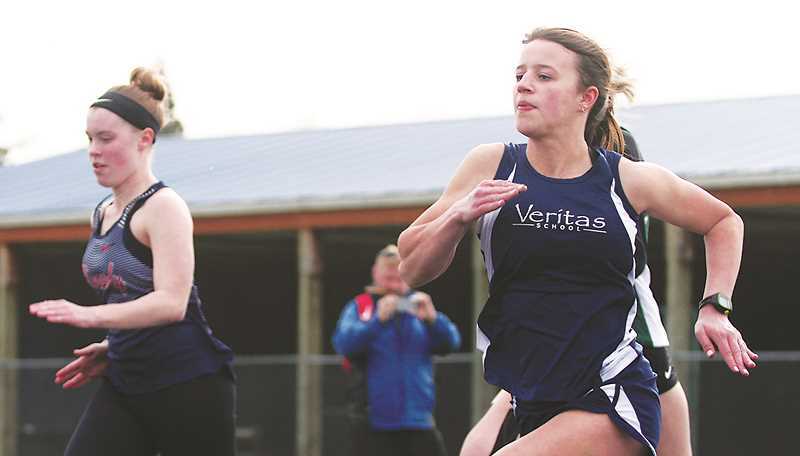 After its first season of existence ended with some valuable experience for many of its athletes, Veritas School enters the 2019 track and field season hoping to take the next step. Coach Ken McChesney leads a squad that has nine returners out of 17 participants and a roster that includes five freshmen, four sophomores, six juniors and two seniors. Leaders for the boys include junior Cam McChesney – the coach's son and an elite cross-country runner – in the distance events, junior Nic Ereminas among the sprinters and junior Will Lattus in the long jump. Senior Chloe Wassei is the veteran leader for the girls. "Last year we were brand new and we had a lot of flexibility with the kids figuring out what we were doing," Ken McChesney said. "This year I feel like we have a lot more leadership because we have people experienced in events now." In the season-opening meet at the Kennedy Icebreaker, Veritas had a handful of solid showings that the coach said showcased marked improvement from last season's results. Ereminas finished seventh in the 100- and 200-meter sprints, Cam McChesney beat St. Paul's Broden Lear by more than a minute in the 3,000 meters, Wassei finished second in the girls 800 meters and her younger sister – freshman Chloe Wassei – placed third in the 400. It is going to be a challenge for Veritas to win many of these events against stiff 1A and 2A competition, much less make it to state, but the team is figuring out which events are its strongest as the season gets underway. "Right now we are trying to figure out where our strengths will be when we get to districts," Coach McChesney said. "We're still at that experimental stage of the season where we're trying people out at a lot of different places. This week will be running people in things they might not be used to, which will be good for us." The Vanguard will travel to Tualatin on Thursday for the Wolfpack Small School Invite, where 24 other schools at the 1A and 2A level will hit the track to battle for early season supremacy. Due to the size of the event, Ken McChesney said Veritas is deciding which events to place its 17 athletes in, spreading them out in order to gain important experience. The team ran a 300-meter hurdler in the Kennedy meet, which was the first time that had happened in program history. Some individuals also set school records, which is bound to happen many more times this season considering the program is in just its second year. Coach McChesney said he is optimistic about the team's chances despite a lack of experience. The Vanguard have a chunk of athletes with a full year under their belts, so the hope is to start picking up some individual wins in the regular season and beyond. "We have a lot of returning kids that understand their events so much better," he said. "We get what we are trying to accomplish and the growth and athleticism has made a tremendous difference."